<300NT, 3 hearts, 300-600NT, american, dinner, lunch, taipei main station (台北車站), western. 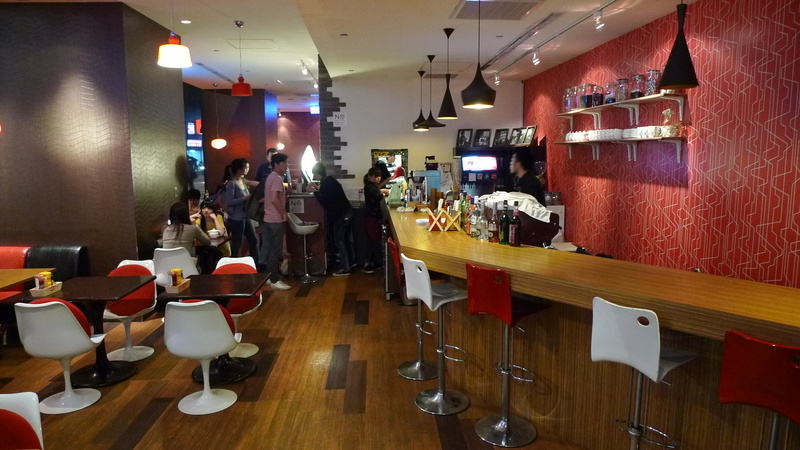 A large group of indecisive people is how we ended up at Rock Sauce Bistro and Bar located on the first floor of QSquare mall at Taipei Main Station. After trying to figure out what to eat for 30minutes, Gary and I decided to take charge and just picked the nearest restaurant to where we were standing that looked decent. Rock Sauce is located outside of exit U5. When you first walk into Rock Sauce, it doesn’t look that big. There is a bar to the right and a few tables to the left. We were initially worried that they wouldn’t have room for our party of 10. We were wrong. There is a whole back seating area with plenty of seating. 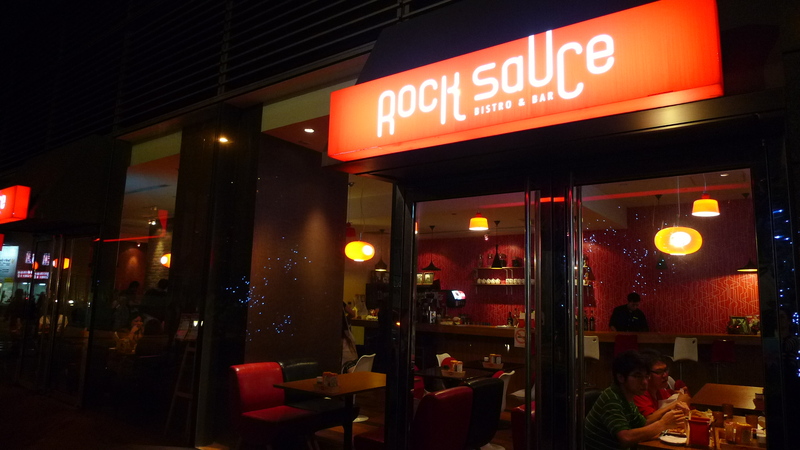 The menu at Rock Sauce is in English and Chinese. The names of the dishes are in English, but the details are in Chinese. The average dish is about 250NT. Note that there is a 10% service charge. Also note that the English description isn’t exactly the same as the Chinese. 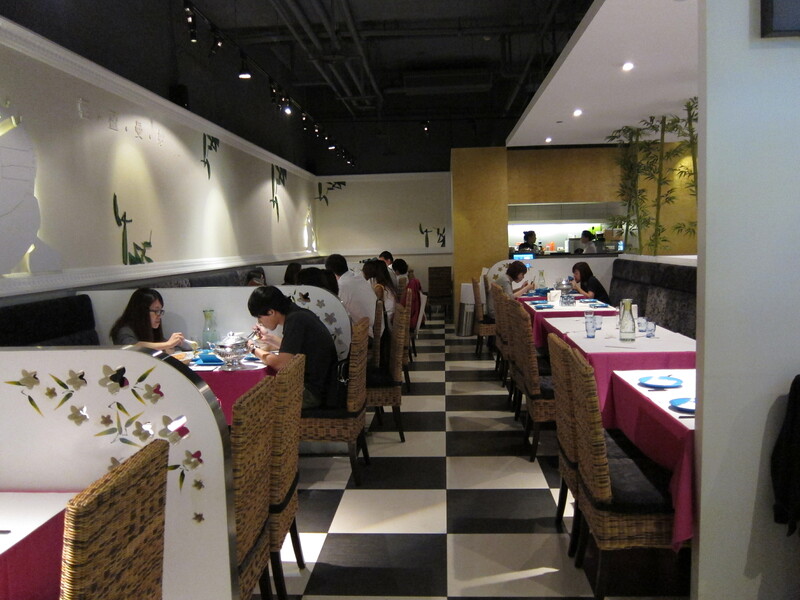 The menu has things ranging from pasta to burgers, to salads to western style breakfast. 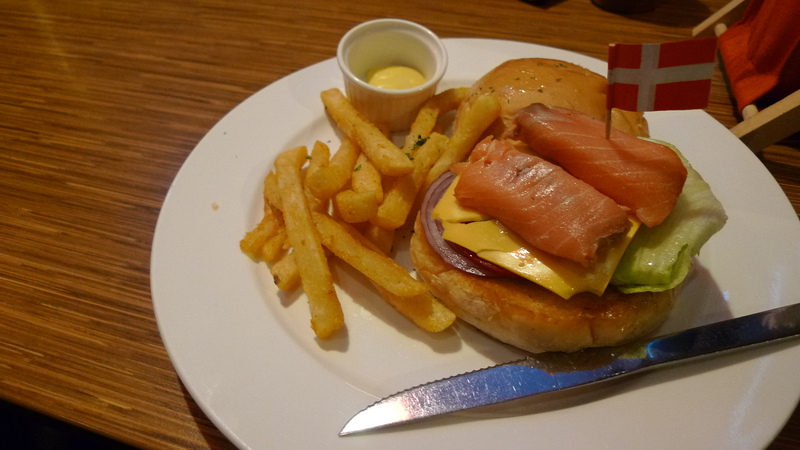 Another thing to note, according to our waiter, they don’t serve pancakes on the weekends…yeah…I ended up getting the Norwegian Salmon Sub (挪威燻鮭魚堡) for 280NT. I love smoked salmon so I figured why not. This is not a sub, obviously from the picture. The Chinese said 堡 (burger), so I’m not sure why the English said sub. Anyways, all the burgers come with french fries, but not a lot. All of the burgers also come with a flag…me and two other people got the Denmark flag and my other friend the Canadian flag. The burger was pretty good. The bread was nice and fluffy, lightly toasted. The salmon was pretty standard smoked salmon with capers wrapped in it. All together, this made a good sandwich. Taste-wise I would probably get this again, but price-wise it’s a little on the steep size for what it is (308NT total). My friend Daniel got the Hawaiian Beef Rice (夏威夷排飯) for 260NT. According to him, the beef was flavorful and tender. From the looks of it, it looked pretty decent. I didn’t have any, but he seemed pretty happy with it and as a fellow food lover, I trust his opinion. 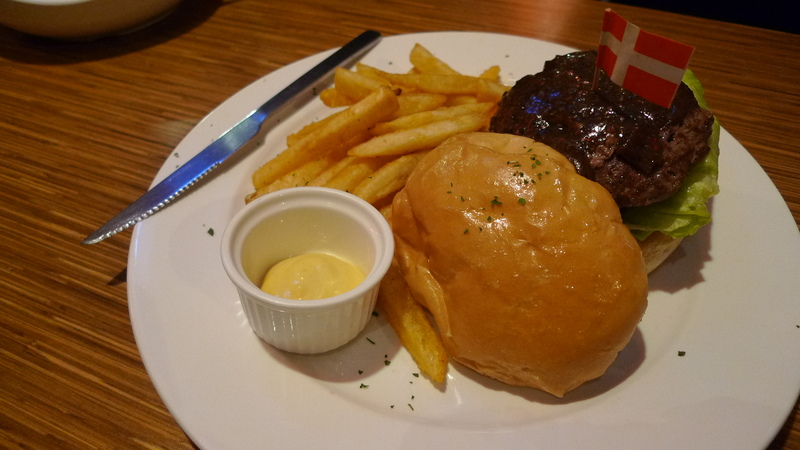 A few people got the Black Pepper Burger (黑胡椒牛肉漢堡) for 240NT. Everyone seemed to like it. It looked pretty good. Overall, this place is okay. Are there better places for burgers? Definitely. Would I come back? Maybe. I don’t know that I would ever be like, OMG LET’S GO TO ROCK SAUCE, but if someone wanted to go, I wouldn’t be opposed. 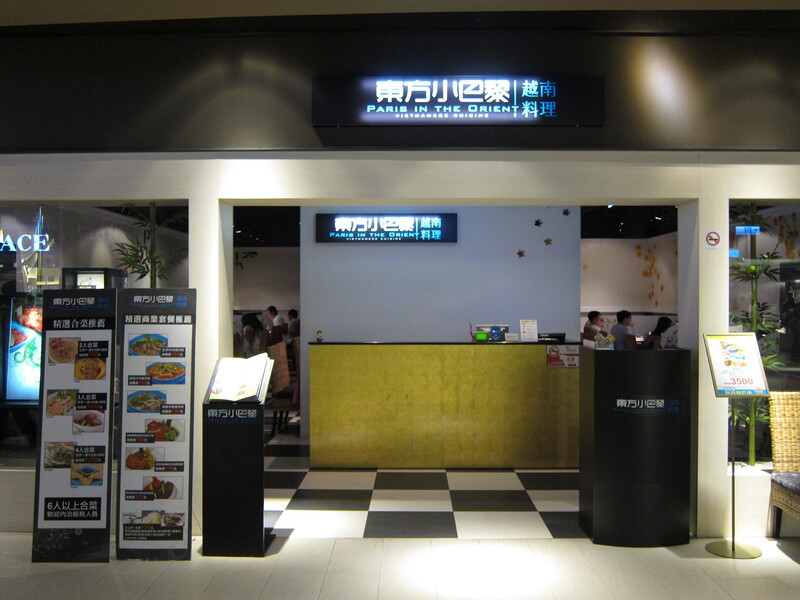 <300NT, 3 hearts, bakery., dessert, dessert., taipei main station (台北車站), western. I always have room for dessert. After the discovery of the B3 floor of QSquare last week, I ended up there again with friends looking for some dessert. 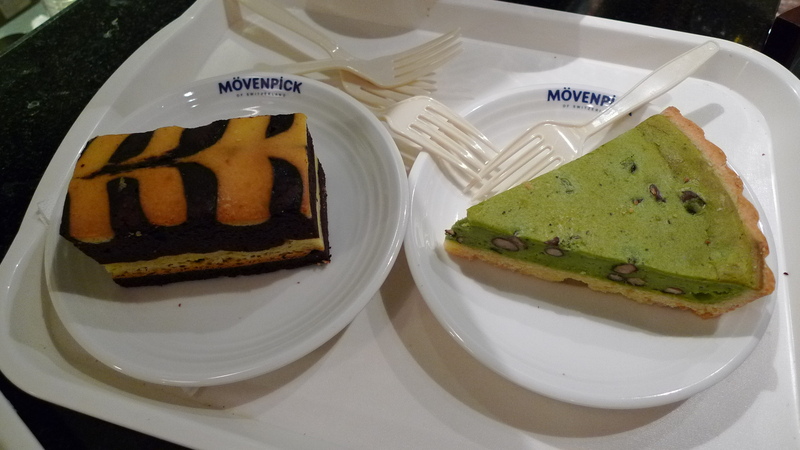 After looking around at all the choices, the cheese brownie (起司布郎尼) for 75NT at Mövenpick Cafe is what caught my eye. Once I pointed out the cheese brownie, my friends and I looked at all the other “cheese pies” on display and decided to get a few things to share. 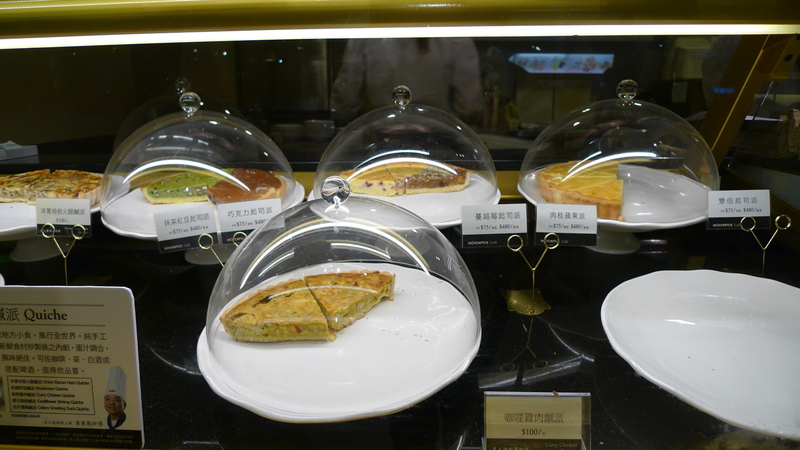 We also ended up with the green tea red bean cheese pie (抹茶紅豆起司派) for 75NT and cinnamon apple pie (肉桂蘋果派) 75NT. Chocolate and cheesecake are easily two of my favorite things in life. So when I saw a cheese brownie I was really excited. This particular brownie was okay. Overall, I thought it was a little dry. The brownie part was pretty good: had a good rich, but not too sweet, chocolate brownie taste. The cheese part, however, was disappointing. I was expecting something almost cheesecake like, but instead it was kind of dry and over-baked. Honestly, I was hoping for more, but this wasn’t bad, it just wasn’t great. The green tea red bean cheese pie was unique, in a good way. It wasn’t so much a pie as it was a tart. The cheese taste was pretty subtle, which was a little disappointing. But, the green tea taste was pretty good. This dessert was not very sweet, very catered toward Asian tastes. Red bean and green tea is always a good combination. The crust was pretty good. Kind of thick, but it had a good flakiness. In December, my friend and I bought a pumpkin pie from Costco and shared it with our friends for Christmas dim sum lunch. 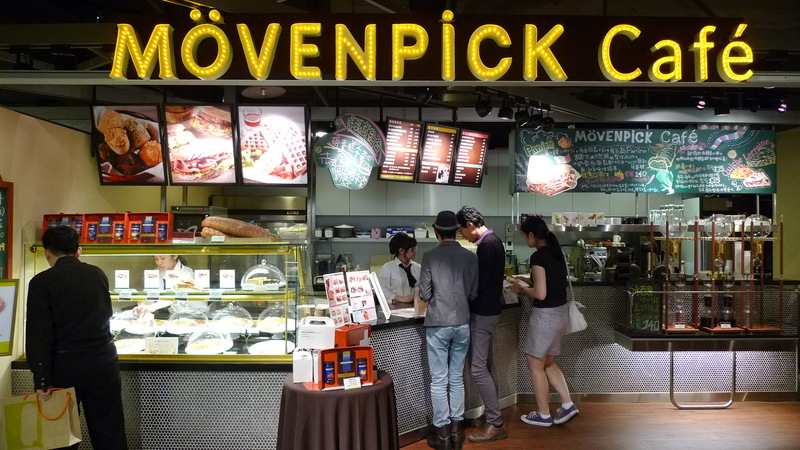 Our Australian friends had never had it before and ended up loving it, so when we saw more pies at Mövenpick, he wanted to try something else new. We went with the cinnamon apple pie. This pie, which was also more like a tart, was probably the best of the three. Very moist, very cinnamony, not too sweet. I have a really high standard for apple pie because my mom is known to make the world’s best apple pie, so obviously this was not anything near that, but it wasn’t bad. Flavorful enough and moist. For a dessert place, this is okay. I don’t know that I’d actually get anything here again, but it served its purpose as a place to get dessert. 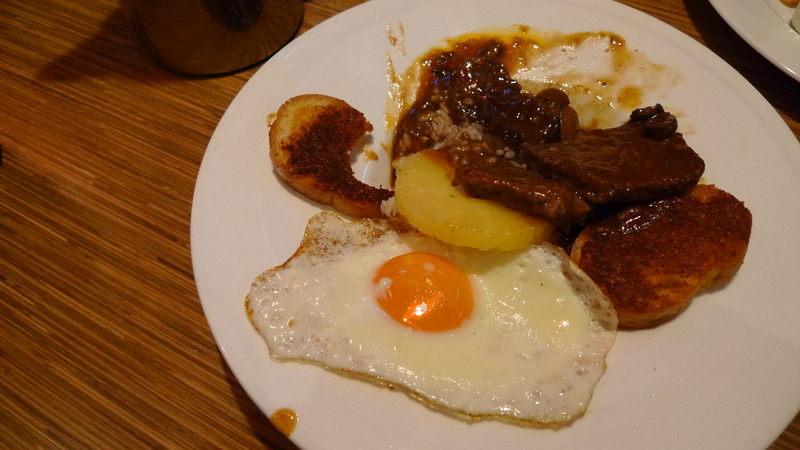 <300NT, 3 hearts, dinner, lunch, taipei main station (台北車站), updated., vietnamese. My most recent trip to the QSquare food court found that Paris in the Orient has closed. I’m not sure when it closed, but a new restaurant has been opened in its place. 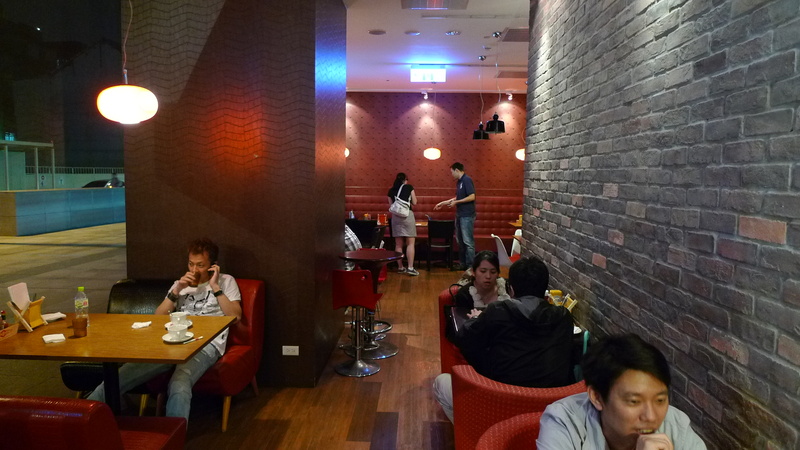 A last minute dinner invite from a friend landed us at the QSquare food court at Taipei Main Station. For someone who has lived in Taipei for two years, I totally failed to realize that A) QSquare had a food court, and B) there was a B3 level. My friends said they found Paris in the Orient by accident one day while lost at Taipei Main. According to their website, Paris in the Orient sits 86 people. I believe it. It was pretty spacious. We ate at around 7pm on a Friday night and there was plenty of seating. 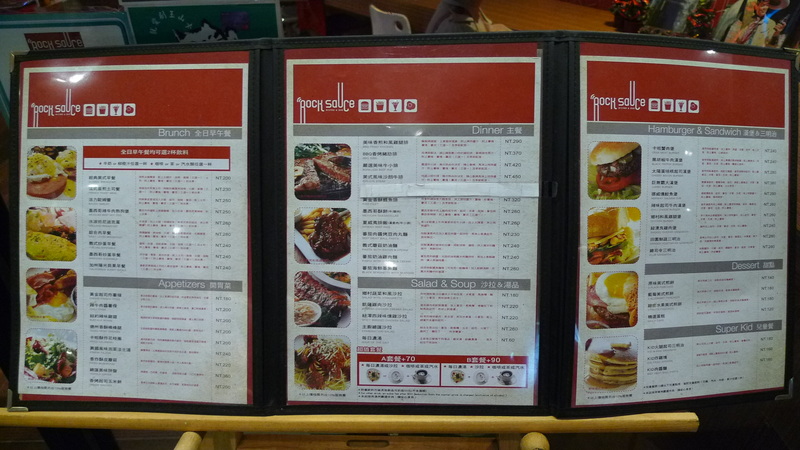 The menu is in both English and Chinese and has pictures of every item on the menu. They have a small section of set meals and the rest is mostly family style dishes. Of our group of five, two decided to order set meals for themselves, and then the remaining three of us decided to get stuff to share. 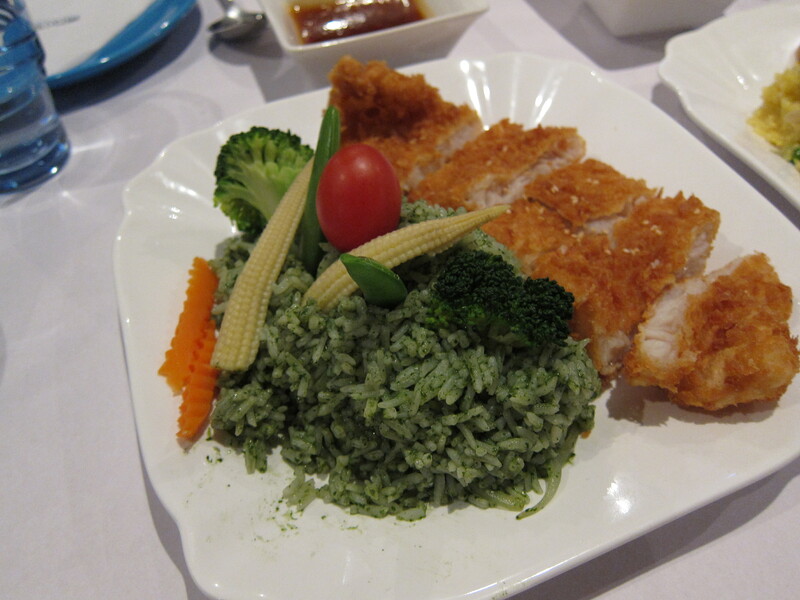 We ordered three of the Spinach Rice and John Dory Fish with Tamarind Sauce (翡翠飯香酥魚排佐酸子醬) for 199NT. I liked this. I thought the fish was fried perfectly: crispy on the outside, nice and tender on the inside. The rice was good, but not special. I feel like for something called “spinach rice” it didn’t really have a spinachy taste. The tamarind sauce tasted more like sweet and sour sauce, which isn’t bad, it just didn’t taste like anything special. 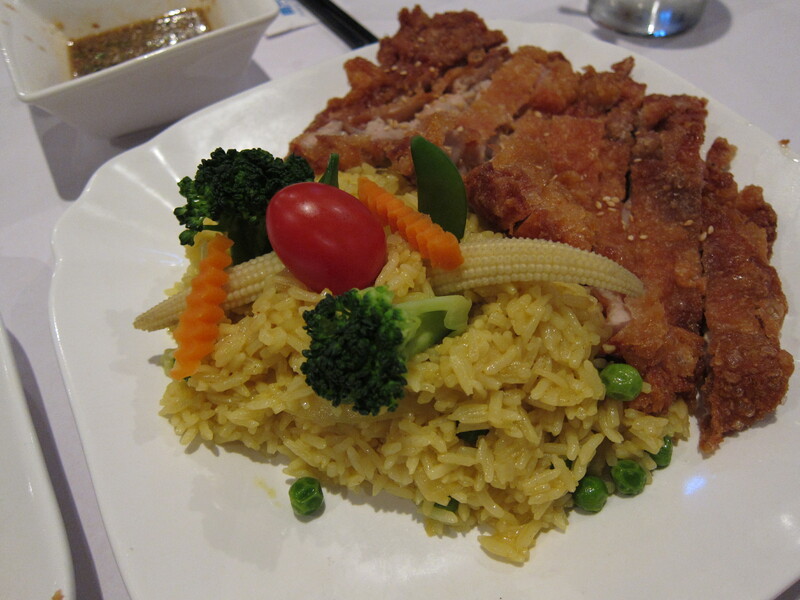 The waitress ordered us the wrong thing so we ended up with the Turmeric Rice and Fried Chicken with Sour and Spicy Sauce (鬱金香飯雞排佐椒麻雞醬) for 199NT. Funny thing was, we were just about to add this to our order when it came out. Angela preferred the turmeric rice over the spinach rice. I think I did, too; it was more flavorful. The fried chicken was good, but I felt like parts of it were over fried. The chicken was still tender, but the batter on some portions was just hard, not crisp. The sauce was pretty standard and tasted more like a marinade to me than a dipping sauce, but that okay, because I still liked it. I liked that it had sesame seeds and cilantro in it. What we had originally ordered before the Turmeric Rice dish was the Stir-Fried Vietnam Pho (越南炒河粉) for 180NT. So this was not what I was expecting, although, I should have known based on the photograph because it looked exactly like the picture. 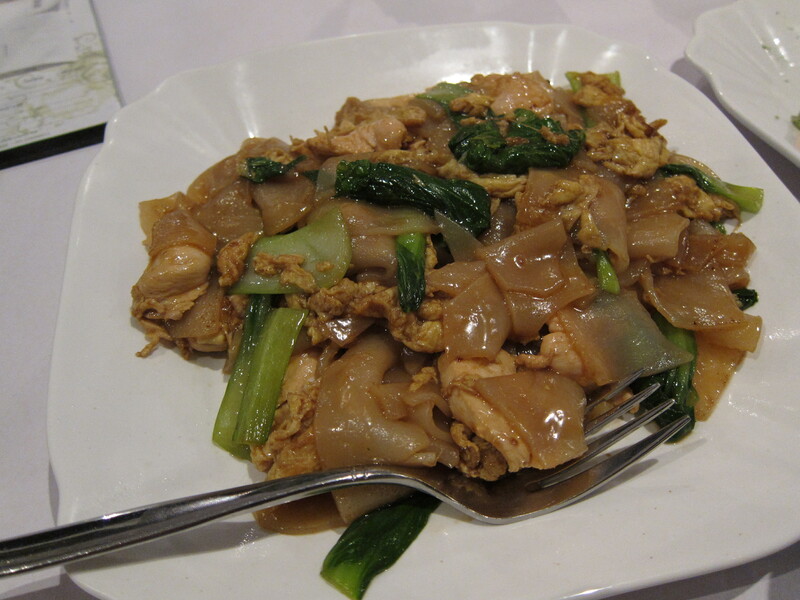 This was basically Pad See Ew, a Thai dish, right down to the flavor. It had the same sweetness that Pad See Ew does, same type of vegetables. This dish was probably my least favorite. I wouldn’t say it was bland, but I feel like it could have had more flavor. I ended up adding some of the marinade-like sauce to add some more flavor. The chicken in it was a little dry and tasteless. I mean, this dish wasn’t bad, it just wasn’t what I was expecting. Overall, this place is alright. Everything was edible, service was good, the restaurant is clean. I don’t know how Vietnamese this place actually is, though. They had some other dishes that looked pretty good. I would eat here again, but I wouldn’t go out of my way to.